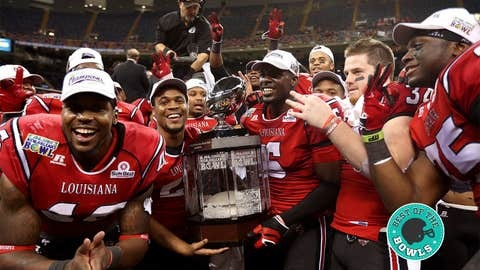 Louisiana-Lafayette left New Orleans with a trophy after beating Tulane. It’s almost 11 p.m. in New Orleans – or “Happy Hour,” as locals call it – which makes it almost midnight in the East, and Tulane and Louisiana-Lafayette head to the fourth quarter of the R+L Carriers New Orleans Bowl tied 21-21. I highly, seriously doubt you’re watching. If you were watching at any time, it was probably before UL-L built a 21-0 lead early in the second quarter, at which point you opted for a Christmas movie with the kids. But now we have a little action to end the final game on the first day of bowl season. A tie game, New Orleans, great fun. 14:46 — Tulane punts after a third-and-9 incomplete pass, giving UL-L quarterback Terrance Broadway a chance to make good on his awful interception on the last drive that led to Tulane’s game-tying touchdown. Broadway was running to his left and tried to throw back across the field (he’s also right-handed, so you can imagine how awkward this is), and the ball just floated up like some dead fish, landing in the hands of a Tulane defender about 10 yards downfield. But now UL-L has the ball back, and the Cajuns are running it. Elijah McGuire for two yards. McGuire for another two yards. I can’t tell if they forgot Tulane tied the game up or if they’re just afraid Broadway might flick another ball straight up into the air with no receiver in sight. The most interesting subplot in this game right now actually is Joe Montana and his wife, Jennifer, trying to stay awake in the stands as the cameras keep showing them. It’s either that or Joe is closing his eyes, visualizing how he could walk onto the Super Dome field right now and lead a drive better than the either QB. UL-L ends up punting – a beauty by Australian Daniel Cadona – and pins Tulane at its own 3-yard line. 11:15 – On first-and-10, Tulane QB Devin Powell scrambles around his end zone before throwing the ball somewhere, anywhere. Of course, it lands in the hands of someone he doesn’t call a teammate. This quarterback play is maddening. That’s the question of the night, Kayla. You’re not alone. Well, OK, I think that’s a little much, Ryan. 9:56 – Good news for the Green Wave: They hold UL-L to a field goal after giving the Cajuns the ball on the 13-yard line. So that’s really a win for Tulane, keeping it only 24-21. Quick side note: To keep myself engaged, I begin searching for current trends in New Orleans and notice that the hashtag #PeopleWhoMadeMyYearGood is the No. 4 trending topic in New Orleans right now and No. 1 in the U.S.
Who are the people making the New Orleans Bowl good? My vote goes to Tulane running back Orleans Darkwa, who has 16 carries, 84 yards rushing, three touchdowns and one badass name. Meanwhile, Tulane passes up a 56-yard field goal attempt and punts instead, pinning UL-L inside the 10-yard line. This was an interesting decision, because the Wave have 2012 Lou Groza winner (nation’s best kicker) Cairo Santos, whose career-high is 56 yards. In pregame, Santos was hitting from 63 yards. So it wasn’t an unfathomable ask for him to connect from 56 here. But Tulane coach Curtis Johnson elects to punt, and by doing so his plan becomes obvious: Broadway throwing another dead-fish ball up into the air has a higher probability of occurring than Santos booting a good field goal from 56 yards. Genius. 7:20 – Johnson’s plan of giving Broadway another meltdown opportunity has a fatal flaw: Broadway ended the last series with cramps and is now back in the locker room getting fluids, meaning quick Jalen Nixon is now running things for the Cajuns. Nixon looks poised at least, running QB keepers and moving the chains. Alonzo Harris powers for 17 yards, and now UL-L is trying to drain the clock with a little more than five minutes remaining. Watching Nixon make actual positive football plays is refreshing and changing the QB mojo in this game. This #neworleansbowl has had some of the worst QB play since the advent of the forward pass. Darrell must not be watching Nixon, because now on third-and-10, Nixon rolls out to his right and drills a good ball to Jamal Robinson for a big first down. UL-L keeps running the clock out and then takes a timeout at third-and-7 with less than two minutes to go. Commercial-break talk: About that Jalen Nixon. Who is he? He’s a redshirt freshman from Lafayette, La., majoring in business marketing, and he spent the last two summers umpiring youth baseball. He’s on Twitter at @JNixon_RealTalk. So UL-L now hands off on third-and-7 and McGuire is tackled for no gain, forcing a Cajun punt. They did chew up almost six minutes of clock, though, and put Tulane back at its own 5-yard line. 1:35 – Our guy Devin Powell is back out on the field for the Green Wave, and his first pass is a short one to RB Rob Kelly that he underthrows by about four yards. Kelly catches it on a hop and angrily throws it back into the ground towards the line of scrimmage. The next play is another short pass to Kelly, another awful throw, and Kelly sits on the ground for a few extra seconds in disgust after the pass bounces incomplete. I don’t think Rob Kelly is having a lot of fun, guys. Is it time for the Wave to go back to Nick Montana? What do you think, Michael Gratien? We know Nick Montanya wouldn’t throw at ankles, Michael, but what about Nick M-O-N-T-A-N-A? Guess Powell is still the guy. So what now? Powell drops back into his end zone, scrambles around like he’s trying to find his way out of a dark maze, and then a voice suddenly says, "Ah hell, just heave it to the heavens, Devin Powell!" So he does. Somehow, Justyn Shackleford catches it for 34 yards to give Tulane a first down at their 39-yard line. 1) I’m guessing that’s not actually how they teach secondary play at UL-L, because the Cajuns are better than that. 2) The tweets . . .
No, Frank – have you been watching this QB play? Johnny Manziel most certainly does not play for Tulane. Do we all need to take five and go outside for some air? OK, I think we do. Powell is feeling it now. After an incomplete pass, he hits Ryan Grant for 27 yards and then Kedrick Banks for nine more, which moves Tulane down to UL-L’s 25-yard line. They’re easily within Santos’ range. Do the Wave run it and ensure that, at the very least, they’ll have a 42-yard field goal attempt to send it to overtime? Or do they try to throw it once and possibly get it into the end zone? They try to throw it, and Powell takes a sack, forcing Tulane to burn its final timeout with 13 seconds left. That’s enough time to pick up six yards, get the first down and then spike it once the ball is reset. Or it’s enough time for one sideline throw. But Tulane doesn’t mess with those options, instead bringing Santos on for a 48-yard attempt. This is a pretty good position for Tulane, right? Yeah, come on, believe in Santos. UL-L calls a timeout to ice him, and the announcers are running through Santos’ credentials. Hey now, CC Machine, think positive. Overtime in this game hardly anyone outside of New Orleans is watching would be fun!